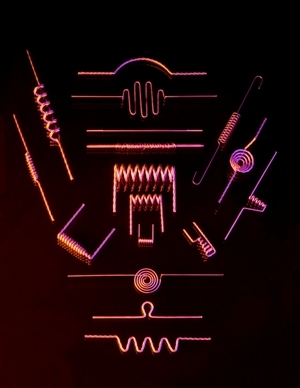 Tungsten metalizing filaments have long been the standard for thin film depositions for a wide variety of materials. The R. D. Mathis Company offers an extensive selection of tungsten filaments to fit most applications as well as custom fabrication to meet your specific process needs. Our filaments are made in house using proven fabrication processes and are of the highest quality, reliability and consistency in the industry. The benefits of using tungsten metalizing filaments for your evaporation process include low cost, long life, high rates with low power, repeatability and ease of use. Custom fabrication is available upon request. Images shown are for reference only. Actual parts may look different based on the type of wire selected. Wire types available for each part are shown in the suffix of the part number. For example, F1-.040W is made with a single strand of .040" diameter tungsten wire. F1-3x.025W is made with 3 strands od .025" diameter tungsten wire, twisted together.